Fresh eyes on London: Where 'd go? Chasing waves along the banks of the Thames. Yes waves. The Thames is a tidal river that rises and falls some 8 metres twice a day. we live near strand-on-the-green and the houses along the river have stopbanks and barriers to stop the water coming in. Dog looks like it is on to something. I remember a few years ago there was a whale in the Thames. What a fun shot! And I had no clue that the Thames had such big tidal shifts! 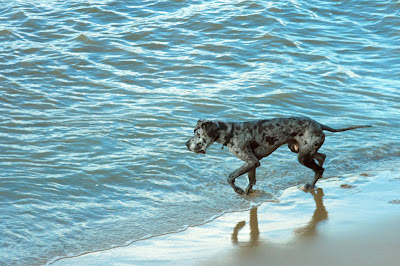 It is amazing that your camera can capture the dog's reflection in the sand. I didn't know the wet sand can have that effect. It really looks like the seashore which I love walking along in the summer. Are you sure you didn't go for a trip outside London? I love all the information you pack into your blog. I learn something new almost every time I read your posts. Thanks. Maybe, the dog hold particular appeal, I just noticed it :D Nice pic! Now I have given you credit on my blog. Is this your dog?, love the pics on your blog!! !